Jim Henson, who heads the Texas Politics Project at UT-Austin and co-directs the poll, sees some unusual coalitions in the issue. “This is one of the areas where the liberal meets the libertarian in Texas political culture,” he said. “You’ve got social conservative opposition, strongest in rural area and among Republicans. Interestingly, mainline Republicans are more restrictive than Tea Party Republicans. 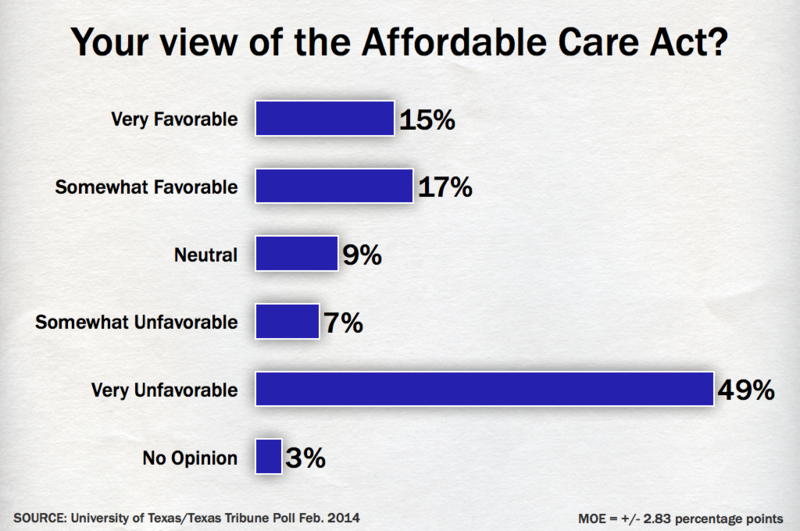 Texans’ views on a couple of other newsworthy issues remain fairly stable. Only 32 percent have favorable views of the federal Affordable Care Act, while 56 percent view it unfavorably — including 49 percent who have a “very unfavorable” opinion of that law. Views of that law vary widely by political bent: 67 percent of self-identified Democrats support it, while 59 percent of independents and 88 percent of Republicans said they have unfavorable views. 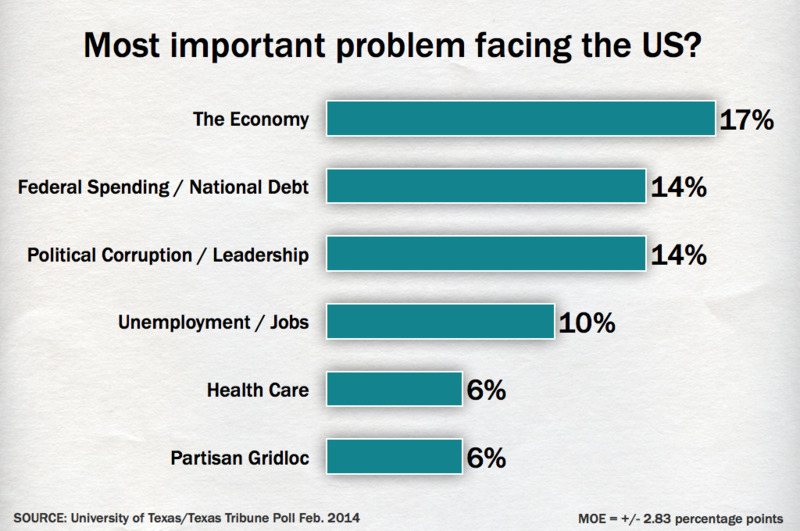 Likewise, Texans’ views of the most important problems facing the country and the state remain relatively unchanged. The economy and federal spending/national debt lead the list of problems facing the country, combining for 31 percent. Add in the fourth-most important issue — unemployment/jobs — and that top group reaches 41 percent. Political corruption/leadership was third at 14 percent. Health care and partisan gridlock were the only others listed by more than 5 percent of the respondents. 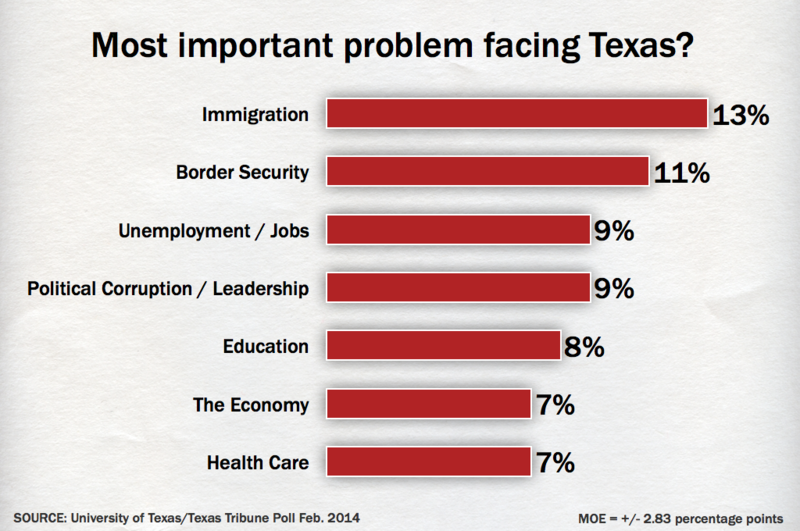 Immigration and border security top the list of most important problems for the state, combining for 24 percent. Five other issues registered with more than 5 percent of the respondents: unemployment/jobs, political corruption/leadership, education, the economy and health care. The University of Texas/Texas Tribune internet survey of 1,200 registered voters was conducted Feb. 7-17 and has an overall margin of error of +/- 2.83 percentage points. Numbers in the charts might not add up to 100 percent, because of rounding. ROSS RAMSEY is editor of The Texas Tribune where this story was originally published. It is made available here through a news partnership between the Texas Tribune and the San Marcos Mercury.